Ignoring the CAFC's American Fertility test applicable to phrases, the Board affirmed a genericness refusal of the term FRESH ORGANICS for fresh fruits and vegetables, unprocessed cereals, and the like, and for retail health food store services. The Board erroneously applied the "compound word" test of In re Gould, which permits a finding of genericness based on dictionary definitions alone. In re Nutraceutical Corp., Serial No. 78975072 (March 13, 2006) [not citable]. The Examining Attorney submitted dictionary definitions of "fresh" and "organic," evidence of prior PTO disclaimer practice for the two words, and NEXIS and Internet excerpts showing various uses of "fresh organic" and "fresh organics." 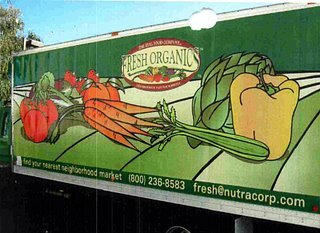 Applicant Nutraceutical Corporation argued that this "limited" evidence was insufficient to sustain the PTO's "heavy burden of proving that consumers use and understand the term 'Fresh Organics' as a generic name for fresh fruits and vegetables rather that as a merely descriptive adjective for such goods." The Board noted that the NEXIS and Internet excerpts were a "mixed bag": some of the evidence "does not point unquestionably toward genericness," while several of the examples "appear to be references to applicant." Nutraceutical argued that evidence drawn from foreign websites was of no probative value. The Board noted, however, that in some instances, foreign web pages "may be considered probative evidence on how a term will be perceived." Applicant contended that here there is no evidence that American consumers "regularly consult foreign websites in making their grocery purchasing decisions." The Board, however, observed that "average consumers in the United States may well link to foreign websites for informational purposes when researching products they intend to purchase," citing In re King Koil Licensing Co., Serial No. 76565486 (March 2, 2006). [TTablogged here]. "However, while we do not discount entirely the impact of the foreign websites in this case, we find them of much more limited probative value than was true in the Remacle case because the foreign websites excerpted herein are primarily articles of local interest about the availability of fresh, organic food items rather than informational resources for the general consumer researching organic food." Turning to the key question of how the relevant public would perceive the term FRESH ORGANICS, the Board observed that "Applicant has done no more than combine terms that are individually generic in relation to its goods and services. Thus the composite is likewise generic. See In re Gould Paper Corp., 5 USPQ2d 1110 (Fed Cir. 1987)." "Based on these dictionary definitions and our common parlance of the English language, we find that the relevant purchasing public would readily understand that 'Fresh Organics' indicates that a variety of fresh, unprocessed and/or raw food items have been grown organically. Thus, we conclude that the term is incapable of functioning as a trademark or service mark in connection with fresh, organic foods." The Board therefore affirmed the refusal to register. TTABlog comment: In considering the genericness of a phrase, the TTAB is supposed to follow In re American Fertility Society, 51 USPQ2d 1832 (Fed. Cir. 1999), which requires (1) evidence of the genus of goods or services at issue and (2) proof that the general public understands the phrase as a whole to refer to the genus. 51 USPQ2d at 1836. In American Fertility, the TTAB had affirmed a refusal to register AMERICAN SOCIETY FOR REPRODUCTIVE MEDICINE on the Supplemental Register, absent a disclaimer of SOCIETY FOR REPRODUCTIVE MEDICINE. The CAFC reversed because the PTO failed to provide any evidence of the public's understanding of the phrase SOCIETY FOR PRODUCTIVE MEDICINE as a whole. "if the compound word would have no different meaning from its constituent words, and dictionaries, or other evidentiary sources, establish the meaning of those words to be generic, then the compound word too has been proved generic. No additional proof of the compound word is required." Id. at 1836. For phrases, however, American Fertility held that there must be proof that the general public understands the phrase as a whole to refer to the genus. That's why it reversed the TTAB's ruling that SOCIETY FOR REPRODUCTIVE MEDICINE was generic. "Under our case law, we must resolve these doubts [about genericness] in favor of applicant. Accordingly, on the issue of genericness, we have no choice but to reverse the refusal to register made by the Examining Attorney." The CAFC's two-faced approach to genericness found -- one test for compound words, another for phrases -- can lead to some strange results. I wrote about the problem in Part II.B. of my article, "The TTAB in 2004 - What Was Hot, What Was Not."